I have a collection of well-worn portrait photography books. Some are better than others and the posing is a little "dated." I keep them because I will occasionally refer back to them and get some fresh portrait ideas as well as some reminders on posing. They are a great resource for posing techniques that are always as close as my book shelf. 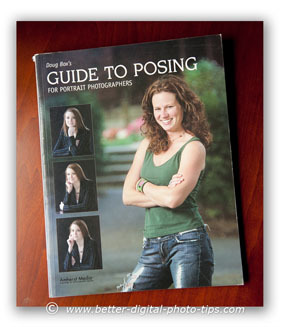 One of my favorite portrait photography books is Doug Box's Guide To Posing for Portrait Photographers. Doug is a master photographer with lighting and posing. The book is full of color poses of male and female, young and old, individuals and groups. Every single page within each chapter has at lease one sample portrait to illustrate the point being covered. Many of the pages have several portraits, showing variations and improvements in posing technique. 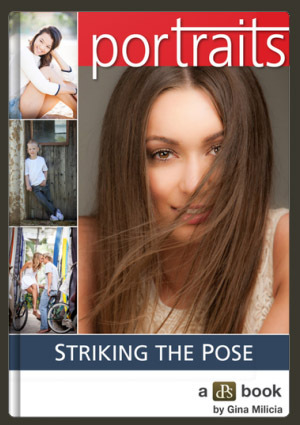 This photography book starts with posing basics, head positions and portrait lengths and progresses through its 16 chapters to more specific subject groups. It also showed how to use corrective posing to "refine" body size, eyes and other facial concerns. I've seen Doug do photography seminars and he is a great teacher of portrait posing and lighting. 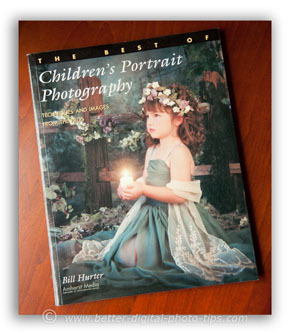 I've also enjoyed Bill Hurter's The Best of Children's Portrait Photography. This book has special appeal for me personally. I started out my portrait photography career primarily photographing babies and children. It is a collection of over 30 talented portrait photographers' techniques and images. Bill is a prolific writer of photography books. What I like about this book is the scope of breath-taking portraits showing a wide variety of portraits from talented photographers with different styles. There are some photography studio poses, but also quite a few with a natural environment portraits which is now my personal specialty. The guide has 5 main chapters: Camera technique and equipment; Studio lighting; Outdoor and natural lighting; Posing and composition and a fifth chapter devoted just posing babies and children. Children's Portrait Photography also has a well-written glossary of photography terms, mostly related to lighting and composition. 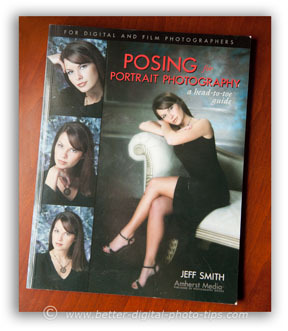 Like Bill Hurter's book, Jeff Smith's Posing for Portrait Photography is also one from Amherst Media, a publisher of a tremendous number of books on photography. It covers all the detail aspects of posing the individual, including specific tips for the face, arms, legs, feet hands, shoulders, hips, bust and waistline. If you like posing the female or looking at well-posed young ladies, this is a great portrait book for you. Most of the photography poses are of young women with a few male poses mixed in. This photography guide gives several examples of slight variations of each model's pose to show you how small changes effect the final portrait. Almost all of the portraits were created inside with studio lighting. Many of these tips can be incorporated in your group posing techniques as well. Like other types of photography, portrait posing is subjective and I don't agree with every single photography tip given in these books. Bottom line though is that both professional portrait photographers and brand new beginner photographers can learn from these portrait photography guides. I got this eBook shown below in pdf form and it very well written by a very talented photographer, Ed Verosky. 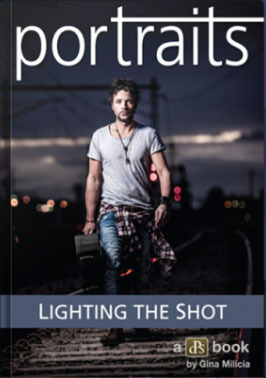 It is called: Taking Your Portraiture to the Next Level and well worth the small investment for a book on portrait photography. Ed's photography is more artistic than mine and here are my thoughts on artistic portrait photography and my own personal review of his portrait photography ebook: Artistic Portrait Photography. There are photography poses of mostly individuals on almost every page and a great beginning section on classic lighting styles, illustrated with examples. You may want to start your own collection of portrait photography books. This Better Digital Photography Tips web site is full of articles on portraits, posing and lighting, but you may prefer to get something tangible in your hands. A printed book is easy to browse through when you are away from your computer and offers a different mode of absorbing useful information about photography. You can read more reviews on these books on portrait photography at Amazon.com as well as many other related books on photography. Are you looking for some creative ideas for family portrait photography? Here is an article titled: Family Portrait Ideas. Good luck and enjoy the process of improving your portrait posing and lighting. Read as many portrait photography books as you can get your hands on. Some are better than others, but you can always learn a few tips, even from the bad ones.